Time to take a break from thinking of Christmas! Your Valentine surprise could be on its way next month with the January Be Mine Paper Pumpkin kit. Perfectly coordinated products set Stampin’ Up! apart, and that is a unique offering. It’s something that you have become accustomed to with our Paper Pumpkin kits. January’s Paper Pumpkin kit is no exception. Also, it will coordinate with the Animal Expedition suite on p. 26–27 of the 2018-2019 annual catalog. Create adorable treats this Valentine’s Day. Everyone will be so excited when you share the special project with them. Finally, you can blend this kit with the Animal Expedition suite and create even more fun surprises. You can probably even brighten someones day without even trying. So let them know how much you care with your Valentine Surprise. Sign up for Paper Pumpkin today and get this Valentine project kit in January. When I prepare for holidays and gift giving, I always appreciate holiday helpers. That is exactly what My Paper Pumpkin is. Sometimes they are cards, other times they are project ideas. Either way, to have something come to your door once a month and be your salvation is always a good thing. Because the holidays are so close, Stampin’ Up! is offereing a great deal on two great MPP kits, 15% off while supplies last. The Frights and Delights from last month and 2017’s November Back in Plaid are available for purchase at the discounted price, if you are a Paper Pumpkin subscriber. I know Halloween is next week, but it’s a great sale to pick them up for next year or a last minute option. Here is the Frights and Delights subscription kit, and refill option. Here is the Back in Plaid kit from November, 2017. I really think the little stockings are so adorable and you can decorate them any way you like. Here is the kit and refill option. Both these kits will make gift giving easy. So get your holiday helpers and be the envy of your friends through Halloween and Christmas. Treats are always welcome and the packaging just kicks it up a notch. If you are not a Paper Pumpkin subscriber, you can subscribe here now and be able to purchase these kits as well. One great benefit of the Paper Pumpkin subscription is having it delivered right to your door. No muss, no fuss. Another benefit is the “all in one” feature of the products and directions. Open the box and go. The kids love them because they can make projects for their class. The instructions have step by step instructions and pictures to make it easy for the kids to participate. Get either of these kits from my online store. Yes, that’s right. Holiday Inspiration just for you. I’m so excited to bring you The 12 Weeks of Christmas. Starting in October, I will be sending a mini newsletter each week to bring you some holiday creativity and maybe a little inspiration. I want to provide you with an array of projects to help you on your holiday crafting journey this season. The newsletters will start on October 3rd and be sent out every Wednesday for 12 weeks. The projects will include holiday cards, gift ideas, tags and packaging. Another great benefit is that these projects will not be available anywhere else. Therefore, you must be on my mailing list to have access to them. It’s a special perk for being a newsletter subscriber. All for you! Each newsletter will only contain the weekly project, recipe to re-create it and instructions on how to put it all together. The rest is up to you. You must however, be signed up to receive my newsletters. These projects will only be available for a limited time through my newsletter. To sign up for this weekly newsletter, simply sign up on the newsletter link on the right side bar of my blog, or click here and add your email address. It’s that easy. Feel free to contact me if you have any questions about the 12 Weeks of Christmas program. I was excited to have been selected to participate at OnStage as a display board sample maker and it was a lot of fun to receive a box of upcoming products from Stampin’ Up! to use for making the samples. Of course, it required that I not share the products or show finished projects until after the meeting and now I am able to start sharing the projects with you. One of the new products received was the Garden Impressions Designer Series Paper package – this 6″x 6″ package of paper containing 4 each of 12 double-sided designs is gorgeous and I used it for making most of my projects. The first project being highlighted is a Mini Treat Bag made with one of the papers from the package. My box of new products also contained the Blossoms Elements embellishments and the Petal Pink Metallic Ribbon so they were used on this project also. A Delicate White Doily was wrapped around one edge of the mini treat bag and held in place with the Powder Pink Cardstock belly band. After wrapping the ribbon around the band, the Sweet Cake Framelits Dies were used to cut the Tranquil Tide Cardstock and Gold Foil creating a backdrop for the flower embellishments. The tag was cut using the Bouquet Bunch Framelits and stamped using the coordinating Beautiful Bouquet Stamp Set. It is important to note that while you are not able to order the Garden Impressions Designer Series Paper, the Blossom Element embellishments and Petal Pink Metallic Ribbon until June, the other supplies are available now. But don’t delay ordering the Mini Treat Bag Thinlits (item #137547) and the Delicate White Doilies (item #141701) – they are retiring on May 31 and are available while quantities last. To order your supplies click here. Thanks for stopping by! Check back again in a few days to see more OnStage Display Samples. Happy Stamping! Happy New Year! Let’s Celebrate! Happy New Year! Hope that you enjoyed the holidays and that 2018 is off to a good start. We had a wonderful holiday with both sons and their families arriving on Christmas Eve for the night. It was lots of fun watching Alex, who is 8, teach Brooklynn (9 months) the tricks to unwrapping gifts. Naturally, she was more interested in pulling the wrapping paper out of the trash bag! Oh, what fun! The world celebrates the New Year and Stampin’ Up! kicks off Sale-A-Bration starting tomorrow so I decided to share a mini-treat bag that can be used for all sorts of celebrations. The Birthday Memories Designer Series Paper (DSP) was used for constructing the bag. The Birthday Friends Framelits Dies made decorating the bag quick and easy using the DSP! 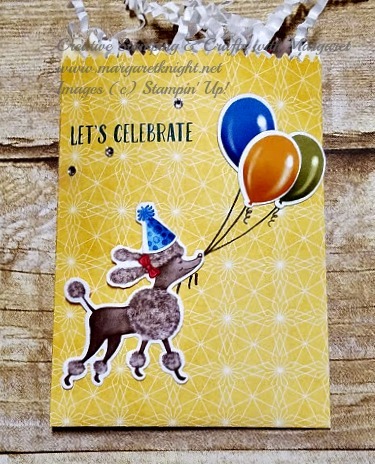 The “Let’s Celebrate” sentiment is from the Birthday Delivery Stamp Set and a mask was used when stamping to block the “your day!” on the stamp. The Birthday Delivery Bundle includes all of these items offering a 10% savings. I finished off the bag by scattering a few rhinestones on the bag. Thanks for stopping by and be sure to check back this week for Sale-a-bration details. The new Occasions catalog also goes “live” tomorrow, January 3!